Youâre ambitious. Youâre not afraid to take risks. You want to bring about positive social change. And while your peers have left a trail of failed start-ups in their wake, you want to initiate change from within an established company, where you can have a more far-reaching, even global impact. 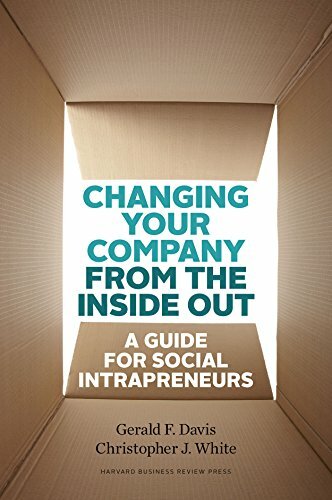 Welcome to the clubÂyouâre a social intrapreneur. Changing Your Company from the Inside Out provides the tools to empower you to jump-start initiatives that matter to youÂand that should matter to your company. Drawing on lessons from social movements as well as on the work of successful intrapreneurs, Gerald Davis and Christopher White provide you with a guide for creating positive social change from within your own organization. Â When is the right time for change? Learn how to read your organizationâs climate. Â Why is this a compelling change? Use language and stories to connect your initiative to your organizationâs mission, strategy, and values. Â Who will make this innovation possible? Identify the decision makers you need to persuade and the potential resisters you need to steer around. Â How can you mobilize your supporters to collaborate on your innovation? Use the online and offline tools and platforms that best support your initiative. About: MAKE YOUR COMPANY A FORCE FOR GOODYou’re ambitious.